House flies can become annoyingly numerous toward the end of summer after they have successfully gone through their larval stage in animal poop or other organic matter. If you have standing pet food, animal poop, cat litter, manure, open garbage cans, broken or missing window screens, doors that are open to the outside of your house, or accessible rotting food, flies will be attracted. Even if you donʼt have these attractants, you may have a fly problem, especially during the summer months. If you have eliminated all the fly attractants on your property and you still have flies, make sure that your neighborsʼ properties are also fly-unfriendly. Good sanitation is basic for controlling flies. Proper food and garbage storage, exclusion, and mechanical controls work much better than toxic, synthetic pesticides. They are also much cheaper. Routinely bury or remove all animal feces or droppings to a sealed garbage container. Clean up all fruit and organic debris. Caulk, seal, and screen all openings to your house. It helps to have fans blowing out the door entrances. Anti-fly curtains made of strings of beads or plastic strips on doorways can reduce the number of flies that enter through doors that have a lot of traffic. 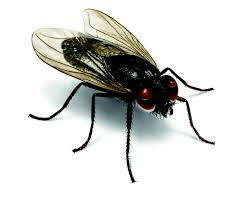 If you have only a few flies bothering you indoors, wait until dusk when flies cannot see as well. Take a jar with a fairly wide mouth and quickly place it over the fly against the hard surface on which the fly is resting. Very gradually and carefully slide an index card between the mouth of the jar and the hard surface without releasing or injuring the fly. Holding the index card firmly over the mouth of the jar, take the jar outside. Remove the index card and release the fly. This is a lot less messy than using a fly swatter. Remove pet bowls and plates. Wash them soon after a pet finishes eating. Other strategies to repel flies are not included here because of their potential to harm people and pets.